Witness the demise of sanity as the Old Gods reawaken and grotesque abominations stalk a seaside Japanese village via collectible event cards that guide the story. 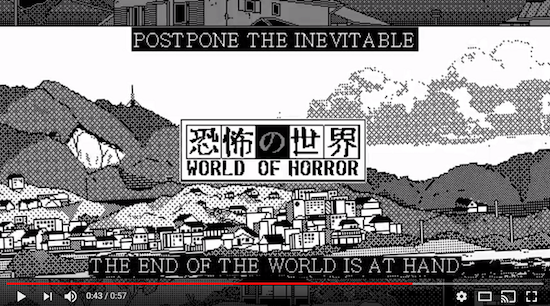 Postpone the inevitable apocalypse through turn-based combat, mysterious puzzles, and stomach-churning investigation. Question reality as WORLD OF HORROR invades the mind with its unnatural imagery and creeping dread in this unnerving tribute to the works of Junji Ito and H.P. Lovecraft.